We have all carabiner keychain sizes from 50mm (2 inch) all the way to 80mm (3.125 inch). In fact, we also have a larger than standard 80mm, the patented LogoBeener®, and also a midsize version at 70mm which has more engraving area than the standard 70mm carabiner. We even have specialized 40mm carabiners (1.5 inch, they are tiny — please call for information). We have the total size selection for you to find the perfect size for your logo or use. In addition to more sizes, we also have more standard options for carabiners as well. They are available with medallions attached, rings attached, rings not attached, straps attached, straps with PVC patches attached, and water bottle holders attached. We have more colors; nine — plus a cool camouflage, and even a bronze we have developed for our star carabiner to go along with gold and silver. Our anodized colors include royal blue, Caribbean blue, red, orange, green, purple, gold, silver, and black. Our pricing is better because we stock our carabiners, we engrave, we watch the quality of both the engravings and the items themselves carefully and we ship. Our engravings are cleaner and crisper and whiter because we only purchase new, state of the art engraving equipment, not used equipment via fire sales from defunct companies. Our equipment features the latest laser technology, and has the very finest "hit" area of all lasers for laser etching, which translates into the very sharpest engraving available. And our turnaround time is faster because we specialize in engraving, here in Ohio. We often ship faster than the 3 day standard production time listed on most engraved items. We have all three styles of the classic carabiner: Level, Round and Pear (or "Bar"). The level engraving area protects your promotional investment from wear and damage as most items that contact the carabiner will do so on the edges as opposed to the level area where your engraving is. We also provide the "round" and "pear/bar" shapes as well — the "pear/bar" shape in particular is excellent for hanging items like tennis screens, etc. As a manufacturer, we are able to provide these products in level, rounded and pear/bar shapes, and, again, as a manufacturer, we also are able to custom anodize your order using Pantone colors to match your specific brand requirements. Are you using carabiners to hang items, or perhaps as a way to connect a deck-like grouping of printed cards or other materials? The graphic above shows the hole size you'll want to plan on making for the carabiner to slip through to have a little bit of wiggle room, and still have a great fit. Request a free sample to make sure the size is perfect for your use. Quality Aluminum, Advanced Engraving Equipment, Lowest Prices and True Custom Options. 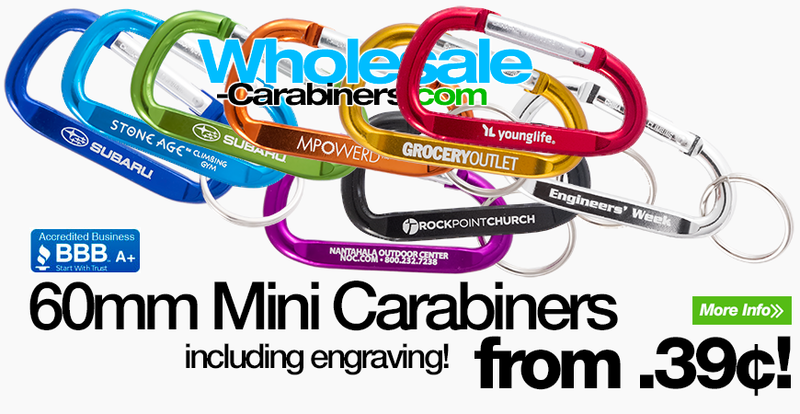 Carabiner Keychain seekers will appreciate that we offer "Level Best" Carabiner Keychains™. 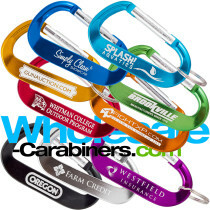 At Wholesale-Carabiners.com, we are a leader in manufacturing truly custom and quality anodized aluminum carabiner keychains, offering the always popular products in several attractive shapes and at always very economical wholesale prices. We provide personalized carabiner keychains in three sizes: 80mm (3.125"), 60mm (2.25") and 50mm (2"), engraving to display your company's name, logo or other message. We use high quality series-6000 aluminum alloy as the base metal, offering a sleek and solid finish that is very smooth to touch. We also use only the most advanced YAG and fiber optic laser techniques for engraving our customers' names, designs and logos on our products which result in a crisp, white engraving. All our products are certified lead-free, and we are also able to apply UPC coded stickers on the items for resale. Looking for a large quantity within a tight timeframe? Utilize our expertise and reliability in delivering large bulk orders, with industry leading lead times. Our streamlined manufacturing process allows us to deliver large quantities, with custom specifications, with critical in-hands dates reliably, efficiently and cost-effectively. Our mission is always quality, convenience, and value — and whether you need a larger or smaller quantity, contact us today to see how we can assist with your custom carabiner keychain needs at industry leading wholesale prices. Need larger quantities than listed? Pricing for all products including our custom engraved carabiner keychains is available for quantities of 10,000 - 500,000+. 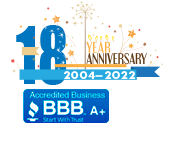 Please call for fast same-day quotes.